Available in both standard intake runner position and a raised runner version, Dart’s 220’s are cast with extra thick walls to allow extensive porting and modification. These heads are ideal for serious street performance, bracket racing and restricted oval classes that require a stock type casting. The 220 is the ultimate in 23° degree small block cylinder heads. Shallow combustion chamber design improves combustion and allows use of larger valves for improved airflow. Interlocking ductile iron valve seats are compatible with stainless steel and titanium valves. Spark plugs are shifted toward bore centerline to enhance flame travel and reduce spark advance requirement. Refined intake port design reduces turbulence and increases air/fuel flow. 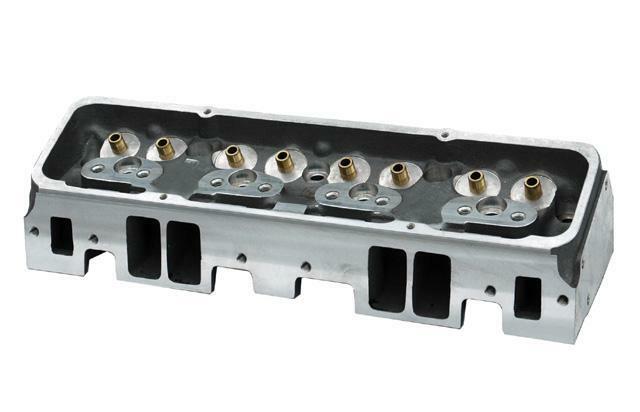 Optional spread exhaust ports allow use of larger primary tubes without header plates. Water passages between exhaust ports improve cooling and prevent “hot spots” that can cause head gasket failure. Gasketed 3/4” reach spark plugs offer widest selection of heat ranges. Integral bosses can be drilled for fuel injection down nozzles.